If you love deep, rich chocolate then this cake may be for you. Low-fat it is not, but heavenly it is. Although it contains stout, this cake does not taste like beer. It simply uses the roasted malt flavor from the beer to lend to the intense character of the cake, the crumb of which is very dense and moist. 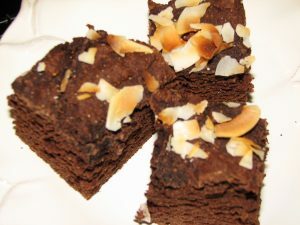 I’ve baked this many times over the last few years and find that while it’s great to eat just a few hours after baking, it’s superb the next day. 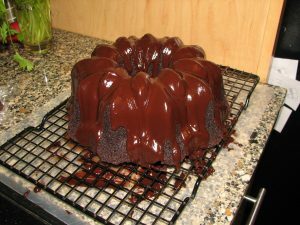 So if you have the ability to make and ganache the cake the day before, I think that you’ll be pleased with the outcome- not that I think you’ll ever be let down if you eat it the first day. 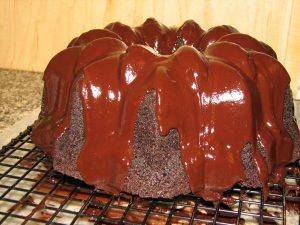 For the ganache, melt the chocolate, heavy cream, and espresso in a heat-proof bowl over simmering water in a sauce pan until smooth, stirring occasionally. 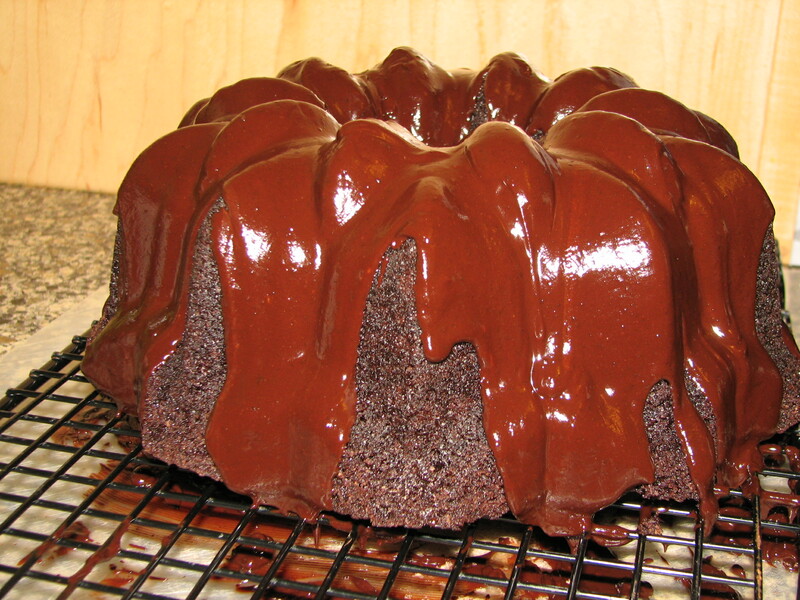 Drizzle over the top of the cooled cake. This entry was posted in All Posts, beer, cake, chocolate, dessert, espresso, vegetarian and tagged beer, cake, chocolate, dessert, espresso, vegetarian. I love to bake, and I love to eat desserts. What I do not love are overly-sweet and/or rich desserts that make my teeth ache and my conscience wish that I had said “no” after I begin digestion. That is where this recipe comes in: a moist cake, rich with cocoa flavor, made indulgent by the addition of coconut milk and flakes, and sweetened with nothing but fruit, but won’t cause a heart attack. I will admit that the batter is a bit on the thick side which can make it a bit difficult to work with. Knowing this ahead of time allows you to set aside extra patience for this very deserving indulgence. 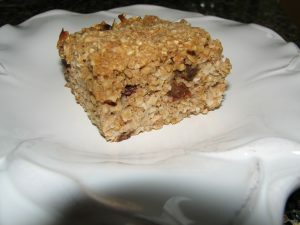 Topped with toasty bits of crunchy coconut I think that it would make for a great breakfast with a cup of coffee or snack with a glass of milk. Preheat oven to 375°F. 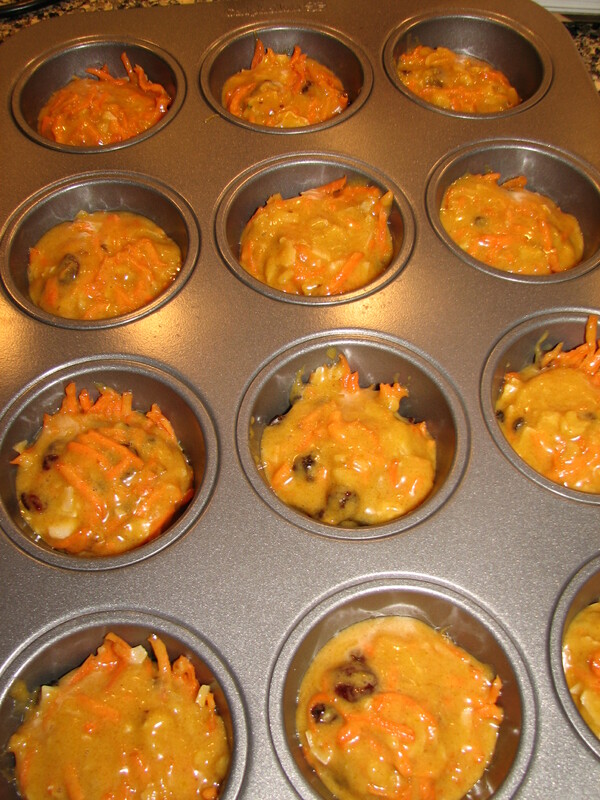 Line an 8-inch square baking pan with parchment paper and set aside. 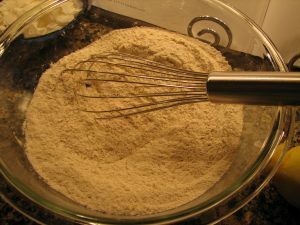 In a large bowl, whisk together cocoa, both of the flours, salt, baking powder and baking soda. 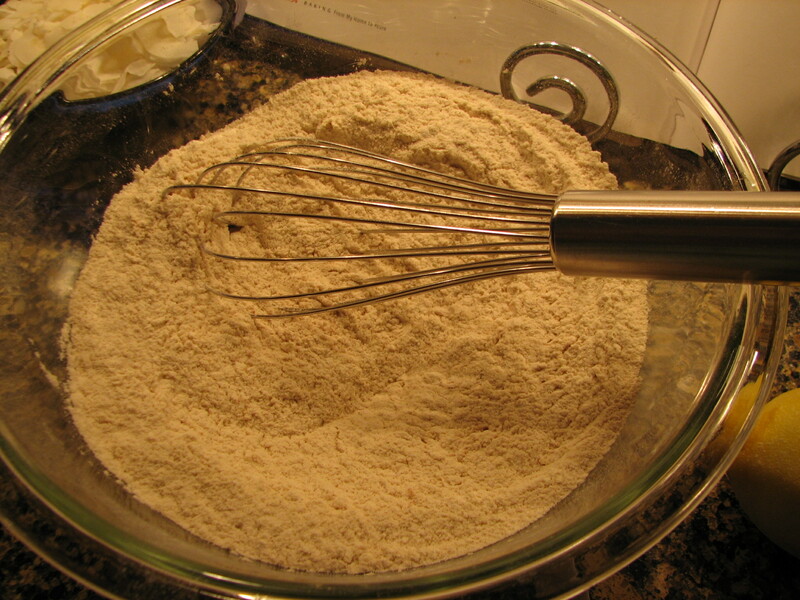 Whisk or sift thoroughly to eliminate any lumps. Set aside. Put the bananas, figs, coconut milk, water and vanilla into a blender. 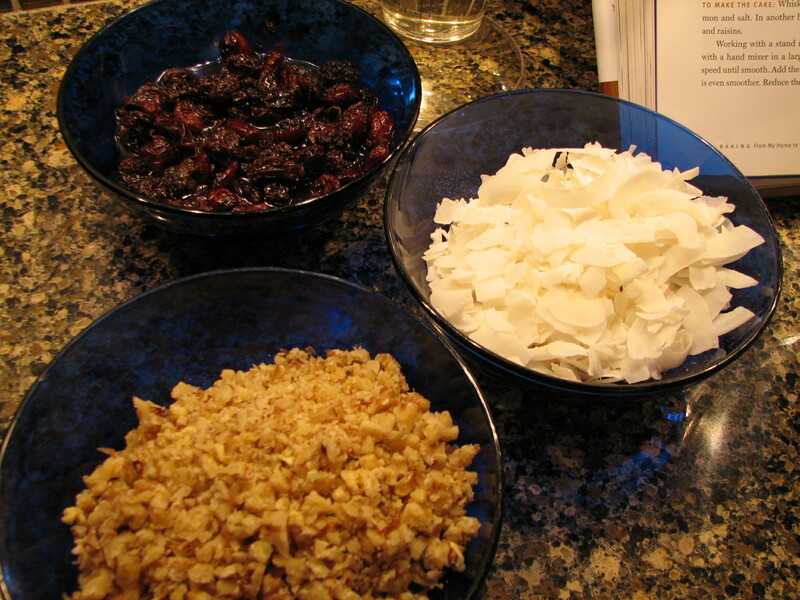 Blend until figs are chopped very small and the mixture is thick and smooth, about a minute. Fold the wet ingredients into the dry until just combined, taking care not to overwork the batter. This batter will be very thick. Pour/scoop the batter into the prepared pan and smooth the top evenly with a spatula. Sprinkle the coconut on top. Bake until the top is firm and a toothpick inserted in the cake comes out clean, about 45 minutes. Let the cake cool in the baking pan on a rack for 5 minutes, then remove from the pan and cool completely. Slice into 16 even pieces. 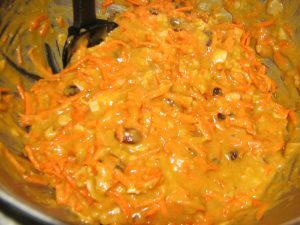 This entry was posted in All Posts, banana, cake, chocolate, coconut, dessert, low-fat, vegetarian and tagged banana, cake, chocolate, coconut, dessert, low-fat, vegetarian.